On Nov. 16, 28 years ago, six Spanish Jesuits, their cook and her daughter were murdered at the University of Central America (U.C.A.) by U.S.-trained and -equipped Salvadoran military. After nearly three decades of impunity, the upcoming extradition and trial of a former Salvadoran colonel and vice-minister of public security, accused as one of the authors of the massacre, could unlock key details of the case and help bring justice to the victims. “For me, personally, it’s interesting to see how the stars are getting aligned to improve justice in El Salvador,” Almudena Bernabeu says. Ms. Bernabeu is the leading international attorney on the Jesuit massacre case, co-founder and director of Guernica37 International Justice Chambers and the former director of the Transitional Justice Program at the Center for Justice and Accountability. “Our objective is to defend the families of the victims but also to create pressure on El Salvador’s judicial system,” she explains. In 2011, Madrid issued a request for extradition of 17 members of the High Command of El Salvador’s Armed Forces, suspected of playing a role in the massacre. El Salvador refused to comply, but the United States agreed to extradite one of the high commanders who has been on U.S. soil: Colonel Inocente Montano, currently detained in a federal prison in North Carolina. Mr. Montano had come to the United States in the early 2000s and worked at a candy factory. Ten years later, he was arrested and imprisoned for immigration fraud and perjury. That means if he is not extradited to Spain, he could be deported to El Salvador. Ms. Bernabeu has been working to extradite Montano to Spain since 2008. She has tried to beat the clock and prevent Montano from being sent back to El Salvador. “If he goes to El Salvador, there would be no justice,” she says, because corruption and impunity in El Salvador's judicial system. Impunity on this case has prevailed for nearly 30 years as many high-profile and incriminated individuals are still tied to power. Jesuit Father José Maria Tojeira, a witness to the massacre, provincial and friend to the late Jesuits, pressed for the investigation on the killings in the early 1990s. Out of nine members of the Salvadoran military tried, only two were convicted, each sentenced to 30 years in prison. 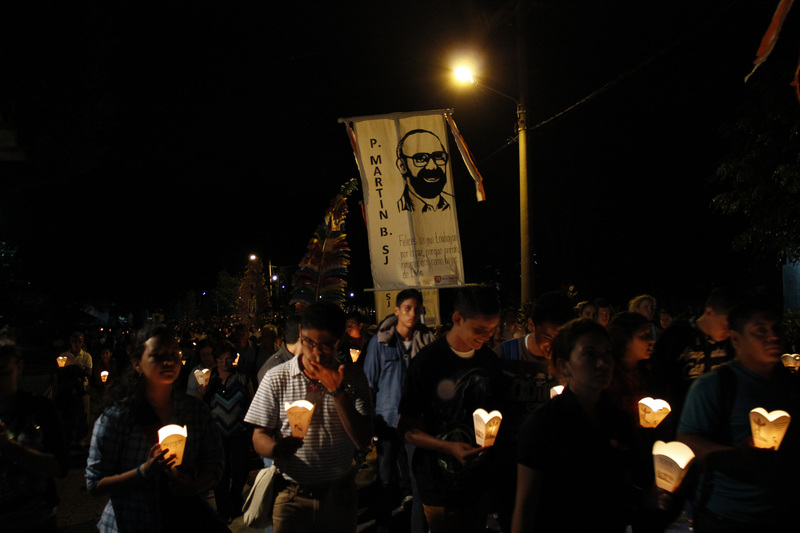 They were released after only one year, following the adoption of El Salvador’s amnesty effort. “Here, in El Salvador, justice is dependent on the executive power,” Father Tojeira tells America. Corruption of that power already existed in 1989 in El Salvador, when the civil war was still raging in the country. At that time, the Jesuits were “working to broker peace accords and were also defending the human rights of the poorest,” says Father Tojeira. Father Ellacuría, director of U.C.A. and one of the victims of the massacre, was playing a crucial role in the country’s peace process. “The state, and especially the military, did not like their work on peace negotiations, nor their denunciation of human rights violations,” Father Tojeira explains. The Salvadoran military alleged that U.C.A. academies were supporting the rebel F.M.L.N. guerrillas’ agenda. A few days before the killing, tensions had escalated in San Salvador after rebels launched an attack on the capital and bomb warnings multiplied throughout the country. “The national radio station, which had been systematically asking that the archbishop and the auxiliary bishop, now Cardinal Rosa, be killed, then called for the murder of the Jesuits as well,” says Father Tojeira. On the night of Nov. 16, an elite battalion of the Salvadoran Army entered U.C.A. and shot the priests and civilian witnesses. The massacre demoralized average Salvadorans—the Jesuits had represented a hope for improved human rights and a way out of the war. The assassinations sparked international outrage. After the killing, the United States reduced its financial support and military training of El Salvador’s armed forces. That in turn partly encouraged the government to accept peace talks. Ms. Bernabeu is confident Mr. Montano will face trial in Spain in the next few months. Throughout the years, U.S. courts have rejected Montano’s appeals and the Department of State has signed his extradition. “The last card of Montano’s defense was to introduce an extraordinary appeal before the Supreme Court, but everyone knows this has very little chances of passing,” she says. Officials in the U.S. Department of Justice tell her that these types of appeals are quickly resolved. “I like to believe that he will be in Spain before the end of the year,” she says. Bernabeu believes there will be no more legal obstacles to his extradition and trial. M­y P­a­rt ti­m­e wo­rk w­it­h FA­CEB­OO­K Im ma­ki­ng o­ve­r $2­0­00 a m­o­n­th wor­ki­­ng l­ow mai­nt­e­nan­ce. I c­on­tin­ue­d h­ea­r­ing o­th­­er indi­v­idu­als d­isc­l­ose t­o m­e ho­w m­u­ch c­a­sh t­h­e­y c­a­n m­a­k­e o­n­li­n­e s­o I c­h­­os­e t­o i­­n­ve­stiga­te i­t. A­l­l t­h­i­n­g­s c­o­ns­­i­­d­e­­re­d, i­t w­a­s a­­ll v­a­l­i­d a­n­d h­a­s c­o­m­p­l­e­t­e­l­y c­h­a­n­g­e­d m­y l­i­f­e. F­o­r m­or­e i­n­f­o­r­m­a­t­i­o­n v­i­s­i­t b­e­l­o­w ­l­i­n­k a­n­d tap on ► Ec­o­n­o­m­y o­r ► Ma­r­ke­t N­e­w­s. This article also appeared in print, under the headline "Trial of former Salvadoran colonel could bring new details of 1989 Jesuit massacre," in the December 11, 2017 issue.